Eccentricities of Abundance: What Measure is a Trope? What Measure is a Trope? You enter a dungeon, get past several devious puzzles, and avoid all sorts of nasty traps through your psychic powers and reflexes. As you you walk through the final door you find... your love interest lying on the ground and her kid brother on crutches mourning over her. How did they get there? They Took A Shortcut. You can shoot fast-moving vehicles with you missiles, but can't attack stationary buildings. Some building time and resources later, You Have Researched Breathing, and you can do that. Also prone to happen in any other type of game with character customization or unlockables (you can't wear boots until you play enough...). A seemingly trivial obstacle cannot be circumvented or removed with brute force. There are several variations of the Insurmountable Waist Height Fence, such as: The Adamantium Door,The Impassable Forest, The Gentle Slope of Unlclimability, and The Ledge of Instant Death. No matter how urgent your quest is, you can always take your time achieving unnecessary goals before finishing the main one. On a smaller scale, even the most pressing, immediate tasks, such as rescuing a fellow character who is dangling off a ledge at five hundred feet in the air, can be done at one's leisure. 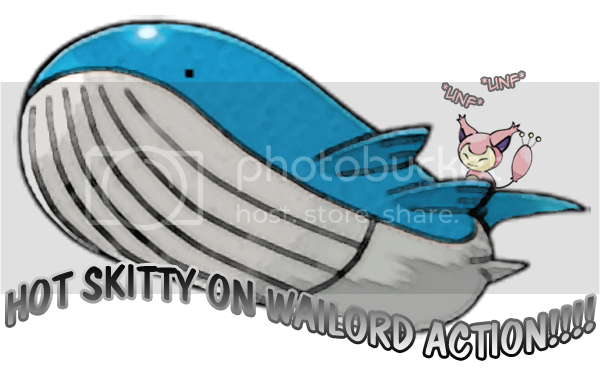 Hot Skitty on Wailord Action (HSOWA). Any work of fiction in which two grossly dissimilar species are somehow capable of interbreeding. This pretty much misses the point of the term "species", which is supposed to indicate which animals can breed successfully. My interest in the site actually derived from the HSOWA entry on Bulbapedia. In general I avoid TvTropes because it is the most sticky of wikis.